From the 2nd February (Monday) Birchbox will be launching a new, slimmer Birchbox aptly named Slimbox. The new Slimbox will allow subscribers to opt in for a box that is slim enough to fit through a standard sized post box therefore making the service more efficient than before, as you wont have to wait in for deliveries or have lengthy trips to the sorting office. The Slimbox will conain the same value samples as the classic Birchbox but at 3.5cm high, it is much more compact making delivery more simple. New subscribers can choose if they would prefer the slimbox or the classic birchbox and existing subscribers can switch from February. I opened it up and was pleasantly surprised with this months contents. I love a mix of lifestyle, hair, body and make up and that is what I received. This is a Birchbox exclusive which retails for £6.50. It claims to be a soothing lotion that is jam packed with nourishing jojoba and aloe oils. I used this last night as a body cream and it is quite light and thin in consistancy and blends quite quickly into the skin. I love the scent too which is always a bonus! Perfect for Travel! This is a small eyeshadow shaped shimmery pink shade that adds a glow to wherever needed, so can be dusted across cheekbones, eyelids or anywhere you want a glow. To me it looks like the perfect everyday shade, then can be dusted on the eyelid and worn alone. Another Birchbox exclusive, this eyeliner looks creamy and from first glance reminds me of the Urban Decay eyeliners. Theres not much more that has to be said about a black eyeliner really, always nice to have and worn by most! I will definitely get some use out of this one! My eyes lit up when I saw this little beauty in the box. I love everything Liz Earle, nothing has ever let me down, and the hair products included. I love these little travel sized products, again perfect for the gym or a weekend away. It contains Vitamin E, fruit extracts and shea butter to boost shine. I have tried quite a few Caudalie products, mainly from beauty boxes and I find that they are always handy for having around, especially if you are low or run out of favourite skin care products. Im looking forward to giving this serum a go as it is oil free and radiance boosting. This is a little added extra to this month box and one I am excited to try. Chia seeds have always interested me so I am looking forward to giving this creamy blend of wholegrain oats, chia, fruit and virgin coconut oil a go. All you do is add water, stir and enjoy. Perfect for cold mornings at work! Overall, with all 6 products this months box retails for around £40 as a full size 30ml Caudalie radiance serum retails for £45 and the Liz Earle shampoo is £5.75 for a sample size. All in all im impressed. Beauty boxes still excite me like a kid at Christmas, even after all these years I have never fallen out of love with them. The star product for me this month has to be the Liz Earle Shampoo as it is a tried and tested product and I know I love it. 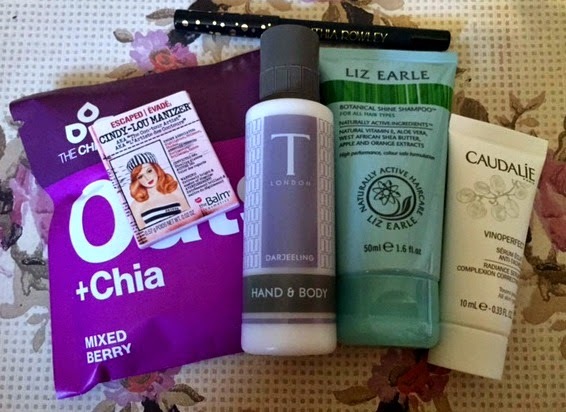 I am loving the Slimline version of the classic Birchbox and think its a wonderful concept. 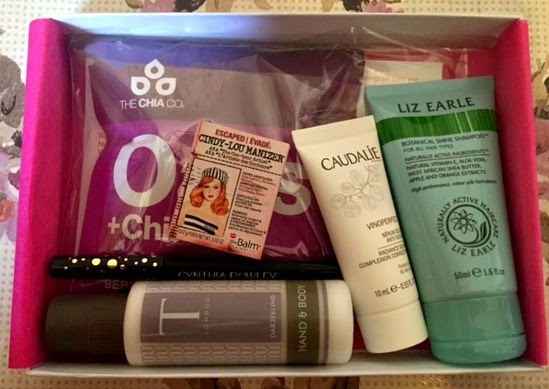 Birchbox costs £10 per month, for whichever box you choose and £2.95 for postage and packaging.